Delia's papers contain a folder containing two pages of notes for a piece called Bring Back dated the 9th April 1968. These papers are, so far, the only evidence of this piece of music. 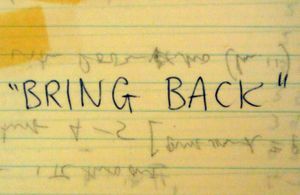 DD100117: Cover of papers for "BRING BACK"
DD100159: Delia's handwritten notes: "BRING BACK! 9.4.68"
DD100221: Delia's handwritten notes: "1) 20/11x15=300/11=27.27" each"
This page was last modified on 10 July 2016, at 10:08.